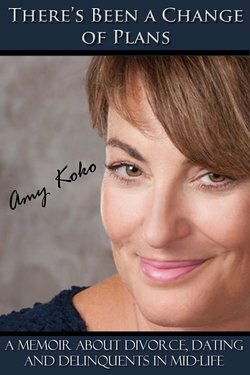 Blogger Amy Koko bears her soul in her witty, bittersweet memoir, There’s Been A Change of Plans: Divorce, Dating & Delinquents in Mid-life. Expecting a trip to Italy, Koko is blind-sided by her husbandbs confession that hebs been putting his shoes under a much younger and prettier woman’s bed. After twenty-seven years of marriage and four children, she faces the unimaginable: her life as she knows it is unraveling around her and her familybs future is anything but certain. In the literary tradition of Nora Ephron’s Heartburn and Jenny Lawson’s Let’s Pretend This Never Happened, Kokobs memoir details her journey from hearing the news that her husband is in love with a blonde, thirty-something Swiss pastry chef to trying everything from thong underwear to a mini-facelift to save her marriage, only to see it die in the parking lot of gas station. With incredible honesty and humor, Koko takes the reader on a wild ride through the tough, emotional times of starting over through divorce, mid-life, finding a job, and Internet dating, all the while trying to keep her four teenagers out of jail. Therebs been a change of plans, and thatbs just the beginning.